Learn more about different types of reports you can create and how you can manage your existing reports. Please note: Professional accounts can have up to 20 custom reports; Enterprise accounts can have up to 500; and Reporting add-on accounts can have up to 2,000. With single data set reports, report on one record type: contacts, companies, deals, tickets, activities, or products. With reports across data sets, you can analyze relationships between two different record types. In your HubSpot account, navigate to Reports > Reports. On the left, select Single data set or Across data sets. Select the data set(s) you want to report on, then click Next. At the top, click the pencil icon edit to edit your report's name. On the left, click Add [Record type] Property to browse and select the properties you want to report on. Drag and drop properties to reorder the columns in the table on the right. To remove a property, click the x to the right. In the left pane, click the Filters tab to segment the records that appear in your report. Click Add filter and browse or search for the property you want to use to filter your report, then set the criteria. If you are reporting on deal amounts and have multiple currencies, you can add the Currency property here to filter deals with a specific currency. Please note: you must add at least one filter to your report. After setting up your properties and filters, click Get data to run your report. Click the Visualization tab to customize the chart for your report. Select a chart type. The options depends on the data you've selected and may include Bar, Column, Line, Area, Doughnut, Pie, Summary, and/or Table. Under Configure chart, drag and drop properties to the Displaying section to add them to your chart. You must choose a date property or a property that gives a specific count to plot your data. If you've selected a line or area chart with a date property as a report measure, you can compare the current data set with a goal or a previous time period. In the upper right, click the Display options dropdown menu. 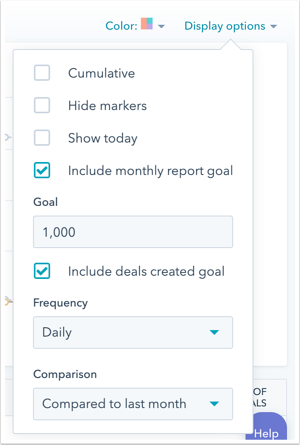 To compare your data with a static number goal for each month, select Include monthly report goal and enter the monthly goal in the Goal field. To compare your data with a previous time period, click the Comparison dropdown menu and select the date range you'd like to compare the current data to. The options displayed here depend on date property filters you've set. If you are reporting on deals, have multiple currencies in your account, and have chosen to display the Amount in company currency property, the Closed amount in company currency property, or the Forecast amount in company currency property, amounts will be displayed in the company currency by default. Click the Currency dropdown menu to convert amounts to another one of your currencies. To receive a file with your report's data, click Export in the upper right. In the dialog box, select the File type, enter the Email address to receive this file and then click Export. When you're done with your report, click Save to add it to your list of saved reports. With a contacts or deals funnel report, you can see how contacts or deals are moving through lifecycle or deal stages over time. You can configure your report to see contacts or deals that have moved through all or any of the lifecycle stages or deal stages you've defined. Learn more about the differences between these two types of funnel reports. On the left, select Funnels. Select Contacts or Deals, then click Next. At the top, click the pencil icon edit to edit the report's name. On the left, click Add filters to select properties to compare across your records. Select a chart type: Funnel bar, Column, or Table. 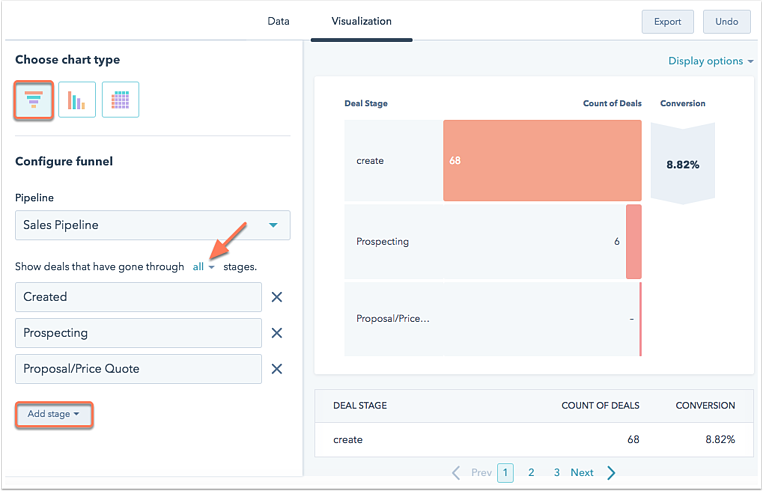 Under Configure funnel, click the Add stage dropdown menu to select stages to include in your report. Drag and drop stages to reorder them. To remove a stage, click the x to the right. 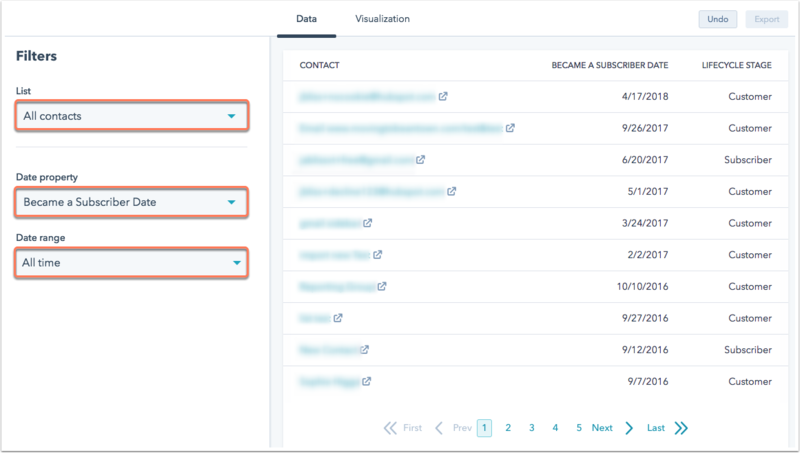 Click the all dropdown menu to report on contacts that have ever moved through all the stages you've selected or to report on contacts that have ever gone through any of the stages you've selected. Only reports on all stages include conversion rates between each stage. In the top right, click Save to add this to your list of saved reports. With an events funnel report, you can see which contacts engaged with events you've created in HubSpot. Use up to five events to define an events funnel. The report tracks how visitors are moving through these touch points on your website over time. Please note: events funnel reports cannot be added to dashboards. In the left panel, select Funnels. Select Events, then click Next. On the left, click the Tag dropdown menu to report on a specific event tag or all event tags. Click the Completion date range dropdown menu to set the timeframe for your report. Under Choose chart type, select Funnel bar, Column, or Table. Click Add event to add up to five events you want to include in your report. To reorder the events, click an event and drag it into place. To remove one of your selected events, click the x to the right. Click the all dropdown menu to report on contacts that have ever moved through all of the events you've selected or to report on contacts that have ever gone through any of the events you've selected. Only reports on all events include conversion rates between each event. Attribution reports analyze the interactions that led to conversion on your website. On the left, select Attribution, then select Contacts. Click Next. Click the pencil icon edit iito name your report. On the left, click the List dropdown menu to select a list of contacts for your report. By default, All contacts will be selected. Click the Date property dropdown menu and select any date property to analyze attribution for a specific conversion on your site. By default, the report will use the Create Date property to analyze a contact's first conversion on a form. Click the Date range dropdown menu to set the timeframe for your report. By default, the report will be set up to report on interactions from All time. At the top, click the Visualization tab to customize your attribution report. Under Choose chart type, select Bar, Column, or Table. Contacts assisted: the number of contacts that viewed your website through a particular touch point before converting. For the All Interactions, First and Last, or Simple Decay attribution models, contacts can be assisted by multiple touch points. For the other models, contacts are assisted by a single touch point. This number includes conversions that occur on the attributed page itself. % of contacts: the percentage of the total number of contacts assisted by the attribution object in your report. For the All Interactions, First and Last, or Simple Decay attribution models, contacts can be assisted by multiple touch points. As a result, adding together the values in the % of Contacts column may exceed 100%. Score / 100: the score is calculated out of 100 points that are evenly distributed across all the contacts assisted by the objects in your report. If a contact's influenced by more than one object, their score gets divided among these objects. With the Simple Decay attribution model, more recent objects get a higher percentage of this score. Please note: no matter which metric you choose for your visualization, you'll still see data for all three of these metrics in your report. URL: the URL of pages on your website that contributed to the conversion. Referrer: the referring URLs of external pages that brought visitors to your website for the conversion. Source (Marketing Hub Enterprise only): the source of the contact's visit to your website that led to the conversion. All interactions: all touch points in the conversion path share equal credit for the conversion. In this attribution model, the score for each contact is divided equally among each URL, referring URL, or source that the contact interacted with leading up to the conversion. First touch: the first page or source from the first visit to your site receives 100% of the score for each contact. Last touch: the page or source that brought the contact to your site for the visit where they converted receives 100% of the score for each contact. Last interaction: the last page view or source that led directly to the conversion. In this attribution model, 100% of the score for each contact will count toward that page or source. First and last interaction: the first and last touch points in the conversion path each receive 50% of the credit for the conversion. In this attribution model, the score for each contact will be divided equally between each page or source. Simple decay: the last six interactions leading up to the conversion. With this model there is more weight given to more recent pages. The points for each contact are distributed starting with the most recent at 50%, 25%, 12.5%, 6.25%, 3.125%, and 1.563%. Once you've chosen your filters, click Run report. To share your report, click Export. Use the File type dropdown menu to choose a file type for your report. Enter an email address in the email address to receive this file text field. When you're done building your report, click Save in the upper right.